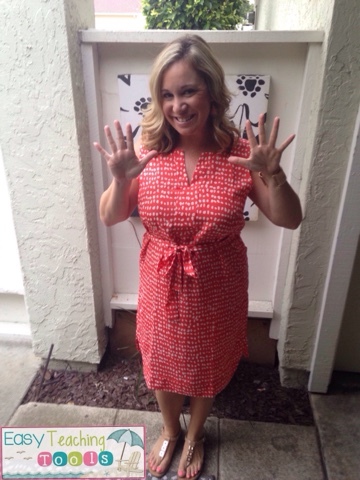 Holy moly, I just began my 10th year teaching. I’m not sure if I’m more blown away that I feel like I finally have credibility at Back to School Night or that I have enough energy to blog after the first day. I’ve learned a few tricks along the way that make for a smooth day and help me keep my sanity, which is tough to do! 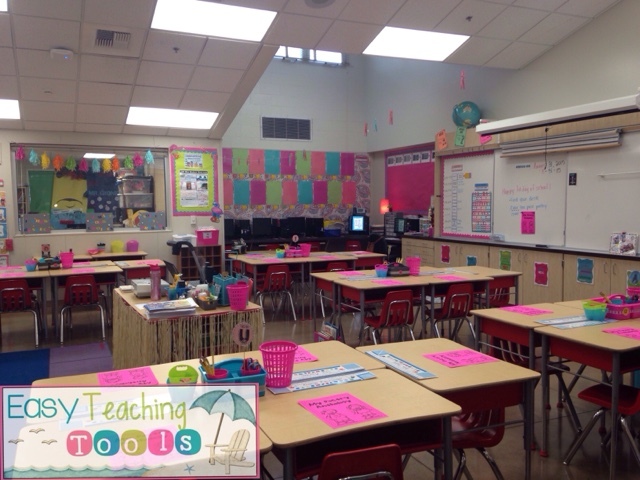 I know parents want to peek into the classroom and evaluate if I’ve got it together! Sometimes, they just want to chat and tell you about their kiddo. But on the first day of school, there just simply isn’t time. This morning, I was still adding names in sharpie to student name tags. 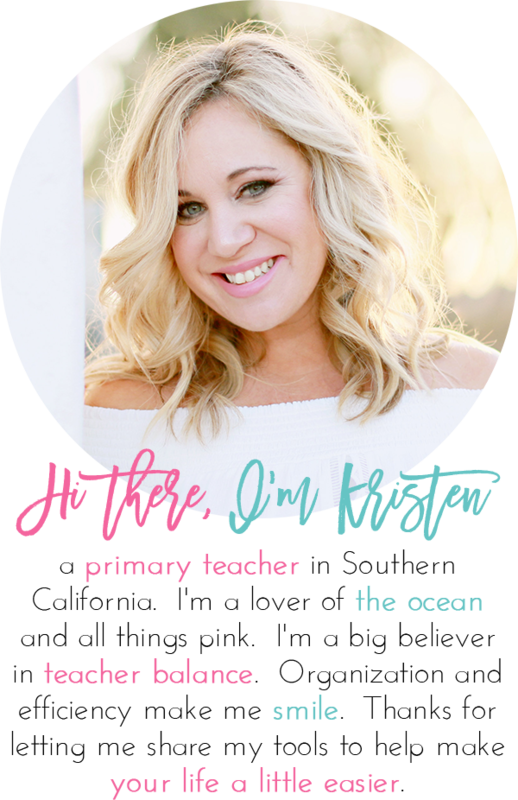 So I took Katie Knight’s idea from Teacher to the Core and spun it into a way that would work for me. I have playground duty so I’m not in my room for some of the time. 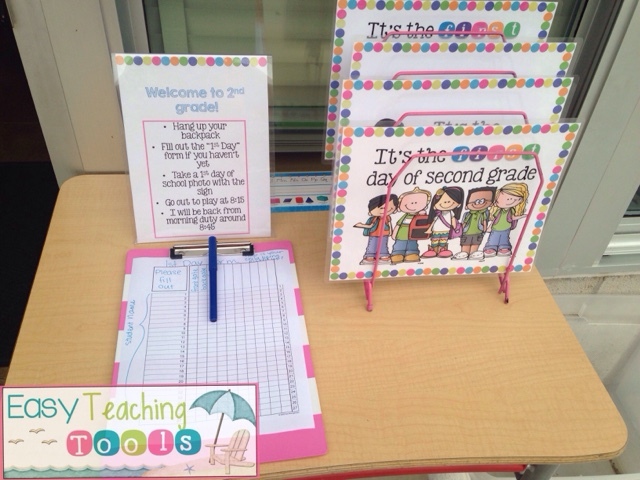 I want parents to feel comfortable and kept busy, so I leave out this little display complete with directions, photo prop signs, and any forms I need them to fill out. I feel like this a good way to say, “I care, your kiddo is in good hands” since I’m not there to say it myself. It’s important to go over your expectations. My kids were thrilled to know that there were only 3 class rules. I know you’re thinking that there’s no way, that can’t possibly cover everything. But it does. Keep your hands and feet to yourself, well that’s Show Respect or Make Good Choices. No tattling, well that’s Solve Your Problems. Promise, these will work for anything! Here in California, we’re GLAD trained so these are the GLAD rules. I also made a I can’t remember the actual name of the chart that has an eye and an ear. 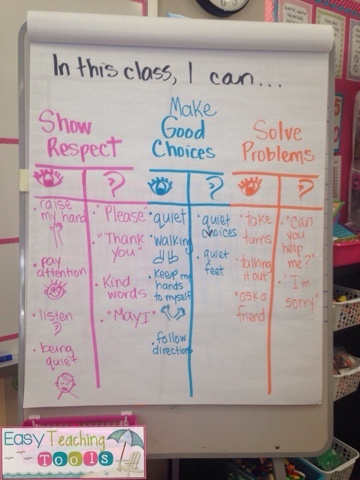 Kiddos told me what showing respect looked like and sounded like. As always, I color code everything to make it easier for my non-readers and EL friends. 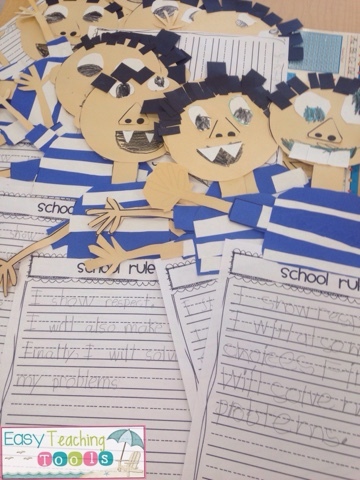 We read David Goes to School and did this cute David craft. I love reading this book because it’s hilarious and a great opening to talk about school and class rules. I’m not sure if I’m going to hang these up. They look a lot cuter than they do in person this year, I’m not sure if it’s because I realized I ran out of black construction paper right before we were going to begin so we didn’t have as cute of eyeballs or mouths. Opps, sorry kids! This little idea was all the buzz on Instagram this summer so I thought I’d give it a try. I didn’t want to deal with trash all over the place on the first day because honestly, I can only deal with so many procedures on one day and imagining kiddos walking around with scraps was making me antsy. 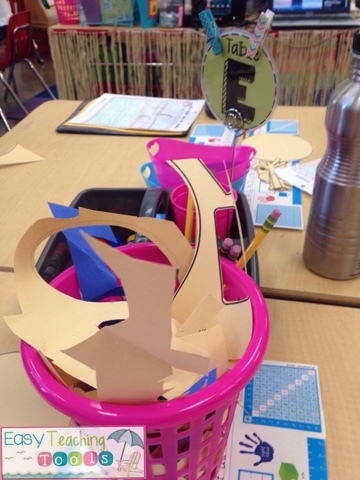 Since I knew the David project required lots of scraps, I thought these table trash cans (really, just baskets from Dollar Tree) would be perfect. Honestly, another sanity saver! 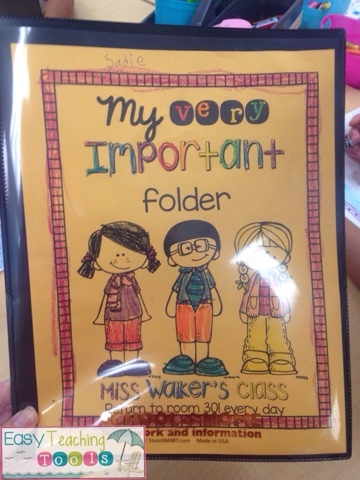 One of my most favorite school supply is this School-Home folder. They are so dang durable and last all year. 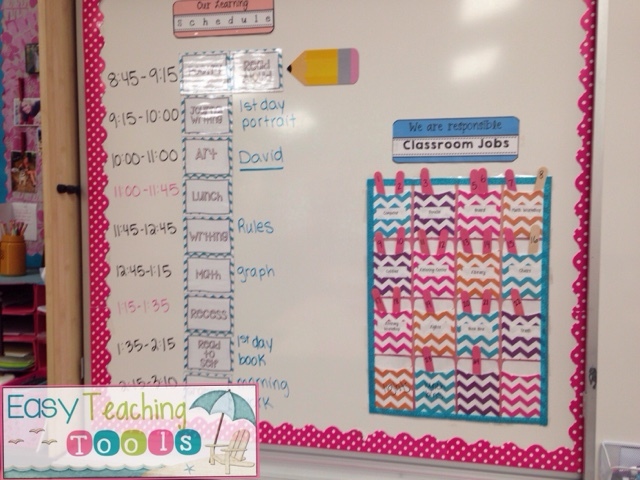 On the front is a cute little cover and the back has their reading log and daily behavior chart. The inside is where it gets really good! The left side says “Return to School.” So anything super important that needs a signature, goes here. This is a life saver on the first day because I don’t have parent e mails yet to communicate, so this baby does it for me. The right side says “Keep at Home” and is where all of their Friday work for parents to see, goes. They are worth their value and so much more. 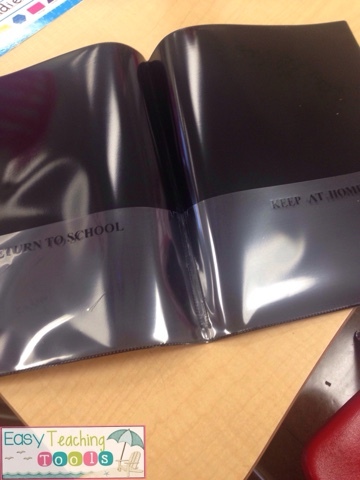 If you can get parents to donate a few bucks per folder, you’re set. If not, find a way to get them, seriously! 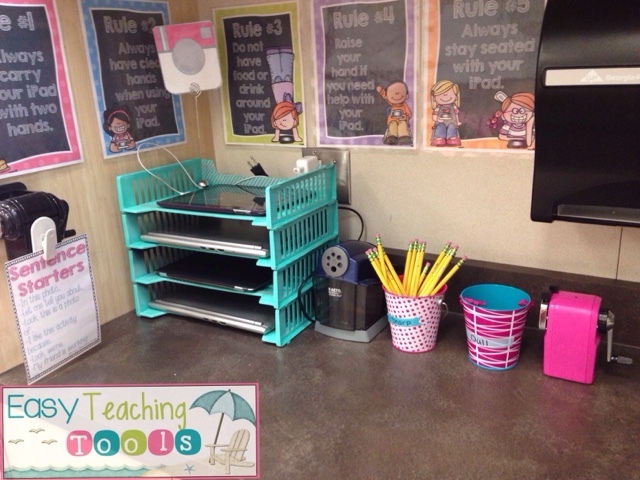 I hope you can use these tips in your classroom. If you already began, don’t worry about it, you can still use them!